When at the office using Microsoft Outlook, when you are going to be away for a while, there’s a neat feature you can do to let others know that you are going to be gone. 1. Make sure you uncheck the response options (that is, make sure “Request Responses” and “Allow New Time Proposals” are deselected). Those are useful when sending a normal meeting request so you can know whose coming, and if they can’t come they can propose a new time for the meeting. But, they are not useful when you are sending a notice that you will be out of the office. You then send it to your coworkers so that your out-of-office shows up on their calendars. You don’t invite anyone to this, and then save it. Whenever anyone tries to look at your calendar to schedule a meeting, they’ll see the time is not available. This lets others know that that time slot is blocked, and it’s also color coded. That’s how you let others know you’ll be away. But what other people do is treat their vacation meeting notices like regular meetings. They’ll send one meeting per the first one above where the time shows up as free, but they allow responses, and also let you propose a new time. The confusion gives way to amusement. Everyone always laughs. And now you know why I send two meeting requests. The one I send to others prevents others from doing the same thing to me (declining and proposing a new time) that I do to them. I suppress the “Decline and propose a new time” option. A couple of co-workers have learned that I always do that, and changed their behavior. I consider that a personal victory. Tonight, from Blue Apron, I made shiitake mushroom burgers. The ingredients were simple: some ground beef, shiitake mushrooms, garlic, hoison sauce, and onion greens. That’s it, I mushed them together and then sautéed them on the stove. They turned out really well. I mean, really medium. 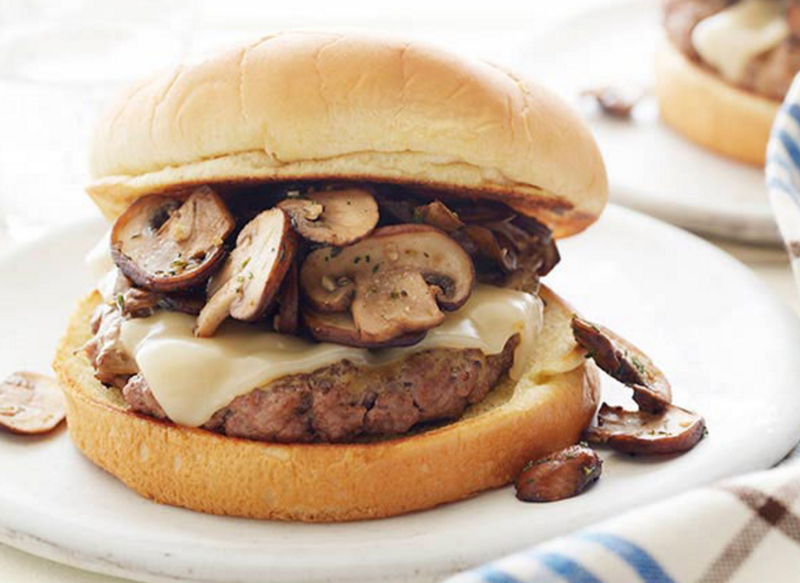 While I was doing that, I was reminded of a time when I was living back in Winnipeg when I had a mushroom burger. For you see, myself and some co-workers one time went for lunch at a place called the Liberty Grill. I had been there several times in the past and never ordered food that was particularly healthy. I was in my mid-20’s at the time so it didn’t matter. Anyhow, I decided to try the portobello burger. I roughly knew that a portobello was a type of mushroom, so I figured that I’d get a burger with a bunch of fried (or grilled) mushrooms on it. I’m not as big a fan of mushrooms as the wife, but I figured it’d be fine since burgers usually have all sorts of tasty (i.e., sweet or salty) sauces on them. But imagine my surprise when I got my burger. I took a bite and sunk my teeth into it, but it wasn’t a mushroom burger, it was a mushroom burger. 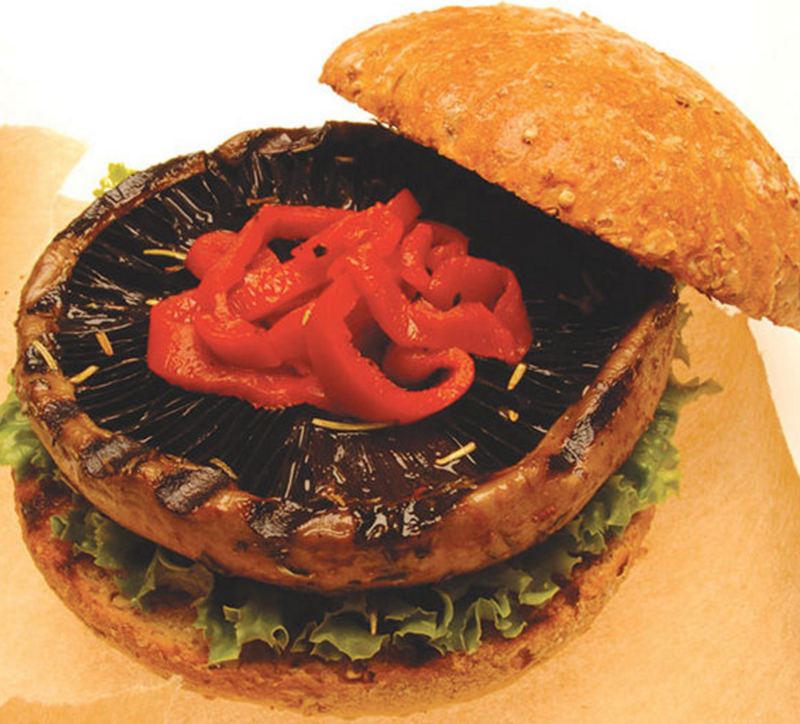 There was no beef patty at all, the patty was a giant portobello mushroom! I opened it up, and saw that there was no meat but instead just a giant mushroom where there ought to have been meat (at the time, I was still 7 years away from cutting back on meat and going partially vegetarian). I realized my mistake, they really did give me a portobello burger. I hadn’t taken it literally. I realized I was going to have to stomach it and tried to force myself to eat it. I may have been disappointed, but I was going to eat it. I couldn’t. I removed the mushroom after only eating perhaps 1/4 to 1/3 of it, and gave up. I ate the rest of the bun + vegetables, and the salad (or fries) it came with. I never ordered it again. Years later I would read about a football player on the Winnipeg Blue Bombers (Kamau Peterson) who had the same experience as me. He ordered a portobello burger expecting a burger with mushrooms, but realized he was getting something else instead. He didn’t like it, either. My shiitake mushroom burger experience was not like that. In fact, it was fantastic. Shiitake mushrooms are full of umami (i.e., they are savory), they don’t taste like regular white mushrooms. They are one of the types of mushrooms that make me understand why the wife likes them so much. It’s too bad they cost 10 times as much. You may remember that last month I mentioned that I am taking an online course in art appreciation. 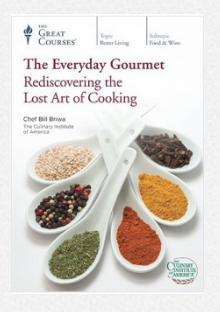 Well, at the same time I purchased that course, I also signed up for an online class about cooking called The Everyday Gourmet: Rediscovering the Lost Art of Cooking. This means I am making my way through two sets of online courses, and I do them in the evenings when I have time (which, for some reason, has not been that much lately). The reason I signed up is because I’ve been cooking Blue Apron meals for about two years now and I’ve gotten better at cooking. However, I’m still very much an amateur without a “philosophy” of cooking. That is, I can follow a recipe, and I know what I like. But, I can’t predict what will taste good together if I were to put something together from scratch. For example, in magic, I know a lot of the theory and can combine various mini-effects to make one longer routine. For beer, I know the various styles and can predict what something can and should taste like. But for cooking, I don’t know what spices should go together, how to pick between olive oil and butter, how long to cook something, at what temperature, how to pair ingredients, etc. I just know what has worked in the past. So I signed up for cooking. Our tongues have five basic taste receptors – sweet, sour, salty, bitter, and savory (umami). When you are cooking foods, you are not supposed to pair like-with-like. That is, if a food is sweet, you shouldn’t pair it with something else that is sweet for a double-shot of sweetness. Instead, you should combine sweet-with-bitter, or sweet-with-salty. That creates a nice mixing sensation (that’s why there is such a thing as sweet-and-sour sauce). So, when I cook and I want to add seasoning to something, I say to myself – what does this food taste like? Is it sour, bitter, sweet, or salty? Once I answer it, I then say “What spice should I add?” If the food is bitter (like kale), I would add something salty, sweet, or sour. I wouldn’t add another bitter spice. Or, if the food is sweet like an orange, I wouldn’t add cinnamon but instead either salt, or another non-sweet seasoning. Speaking of which, a couple of years ago I was at a friend’s place and we were eating watermelon, and I saw him putting salt on it. My friend is a southerner, and I thought he was a crazy person for putting salt on the watermelon. But it turns out, he’s not so crazy after all (at least not for that). Salt + sweet is a good combination of flavors with contrast to give you a different sensation. What he was doing made sense. It turns out I was the one who was wrong! I used to put my food in a frying pan and heat it up, and say I was frying it. That’s not right, I was sautéeing it. To sauté something is to add a little bit of oil (e.g., olive or avocado oil) and then heat it up. Frying it is when you have a deep pan, e.g., 6 inches, and then fill it up halfway, e.g., 3 inches, and then cook your food in it. There’s way more fat involved. French fries in a restaurant are literally fried. I only sauté things. I still don’t know when I would use each of the above techniques, but dry-heat cooking with fat seems to be the easiest and fastest. I’m still early on in the lesson plan, and I have not yet done any of the recipes that the chef has demonstrated, even though they look fantastic. I don’t know if I ever will. But, I do know that when I cook Blue Apron, or do anything else, I am now more deliberate about the chopping techniques I have, the cooking technique I use, and the seasonings I add to the food. And in that regards, the class has been worth it. Well, this is a brutal truth I am now facing. I’ve had some clothes in my closet for years. Shirts, shorts, pants, you name it. I’ve been proud of the fact that I can still wear clothes from years ago. Or, rather, I used to be able to. About a year ago, I went to buy a new pair of jeans. I discovered I had to buy 32×30, instead of 30×30. I wasn’t sure whether or not I had put on weight or if pants sizes had changed. I understand that cuts and styles change over time, so a size small today may not be the same today as demographics shift (people get older, more immigrants, etc.) and stores can’t just important five dozen different sizes. But today I went into my closet and tried on a few pairs of black pants that used to fit quite nicely. None of them fit. Sure, I could get them on, but they all felt tighter around my waist. To be honest, I knew this was coming. I’ve noticed my waist is bigger now than it was 1 or 2 years ago. I’m not sure what’s going on, I exercise my stomach every day. I measure the amount of fat on my stomach using calipers and it’s the same. And all of my shirts still fit fine. I even use a measuring tape above my belly button and write the down the results, and it’s the same from a couple of years ago. Yet my pants require a bigger size. No use denying it. I have to go up in size, I am officially 32×30.